199754039 -This text is intended for those who wish to understand the complex relationships between diet and risks of important diseases, such as cancer and cardiovascular disease. It is aimed both at researchers engaged in the unraveling of these complex relationships and at readers of the rapidly multiplying and often confusing scholarly literature on the subject. 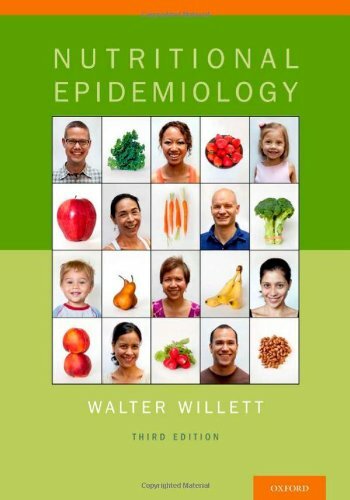 The book starts with an overview of research strategies in nutritional epidemiology-still a relatively new discipline that combines the vast knowledge compiled by nutritionists during the 20th century with the methodologies developed by epidemiologists to study the determinants of diseases with multiple etiologies and long latent periods. A major section is devoted to the methods of dietary assessment using data on food intake, biochemical indicators of diet, and measures of body composition and size. The reproducibility and validity of each approach and the implications of measurement error are considered in detail. The analysis, presentation, and interpretation of data from epidemiologic studies of diet and disease are explored in depth. Particular attention is paid to the important influence of total energy intake on findings in such studies. To illustrate methodological issues in nutritional epidemiology, relationships of dietary factors to the incidence of lung and breast cancer, heart disease, and birth defects are examined in depth. The first edition of Nutritional Epidemiology, published in 1989, was widely praised and quickly established itself as the standard reference in this field. The second edition, published in 1998, added new chapters on the analysis and presentation of dietary data, nutritional surveillance, and folic acid and neural tube defects. This new edition, in addition to substantial updating of existing chapters, includes new chapters on assessment of physical activity, nutrition and genetic epidemiology, and the role of nutritional epidemiology in policy. This book will benefit epidemiologists, nutritionists, dietitians, policy makers, public health practitioners, oncologists, and cardiovascular and other clinical specialists.